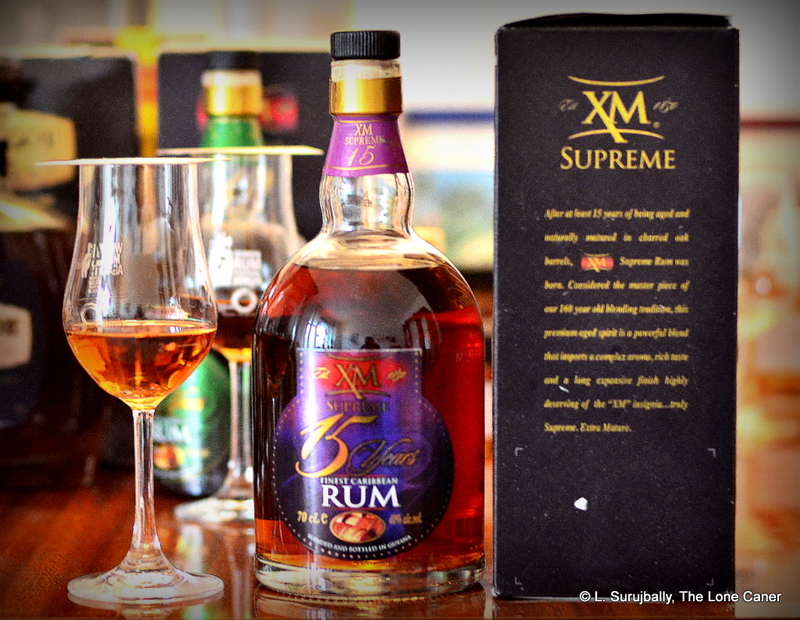 Full disclosure: this review is based on rum made (and drunk) 1995 and earlier and retasted in the 2000s in a social setting. First posted 25 January 2010 on Liquorature. 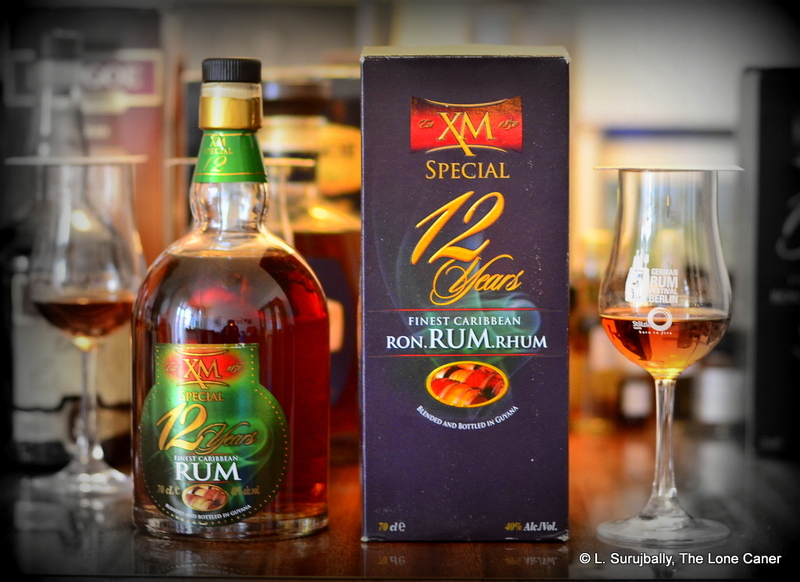 When I was living in the Old Country, this baby was the rum I drank every Friday for five years straight (or more) without fail, and on quite a few days in between. My evenings tended towards heading straight for the Palm Court (behind which I lived) with my friend John, finding a seat, calling Prince (our favourite waiter, because he knew us on sight) and ordering “Double five an’ pepsi, glass, bowl’ice and a Bajan pack a’ B&H.” Translated, this means a double shot of the XM rum in a glass, ice on the side, and a Barbadian-manufactured golden pack of Benson & Hedges cigarettes (the English made ones were more expensive, so one had to specify). 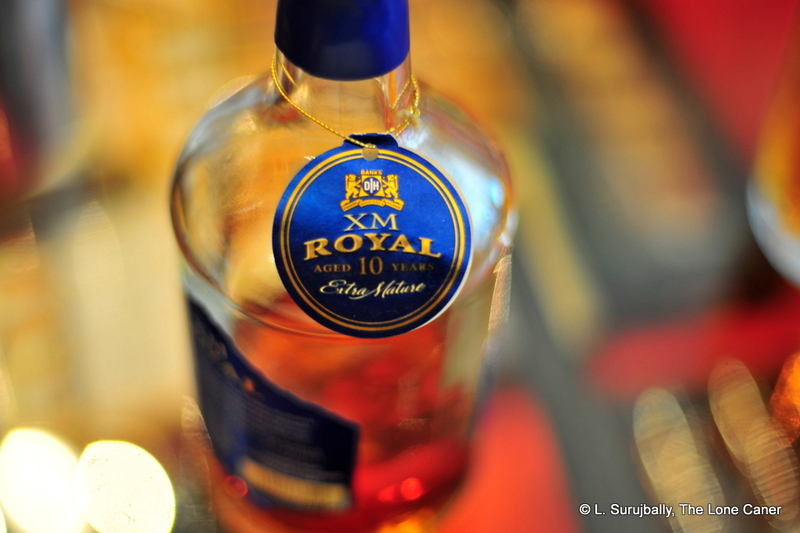 This squarely pegged my social status, since folk of lesser means ordered the cheaper, locally made Bristol smokes and Demerara Distillers King of Diamonds five year old, while the rich upper crust went for XM Ten Year Old and the English B&H. Not surprisingly, my baseline was therefore the XM five year. Now granted, John and I, who always drank together, practically murdered the drink in a bath of pepsi (coke was less available), so one can reasonably ask how the hell I ever got enough notes together for a review, but on occasion we did in fact have it on ice only. Rarely. In fact, vanishingly rarely. All right, almost never. Usually when the pepsi ran out at his place or mine. But there are other good reasons why. 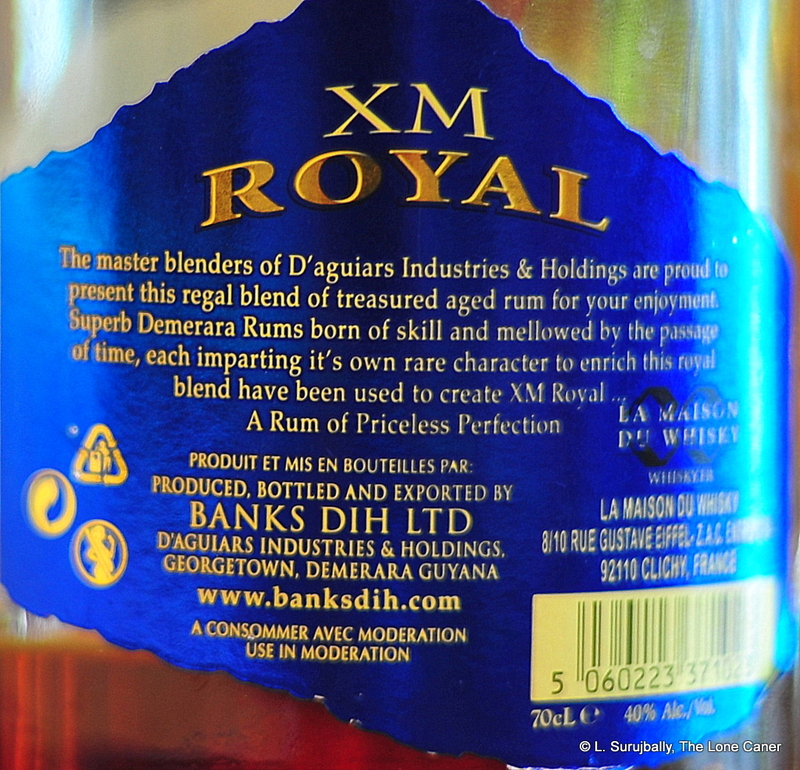 The problem is that this rum was really not for the export market (every Caribbean nation has tipple like this for the masses), and so although one can find it in shops abroad, the quality is not top tier. 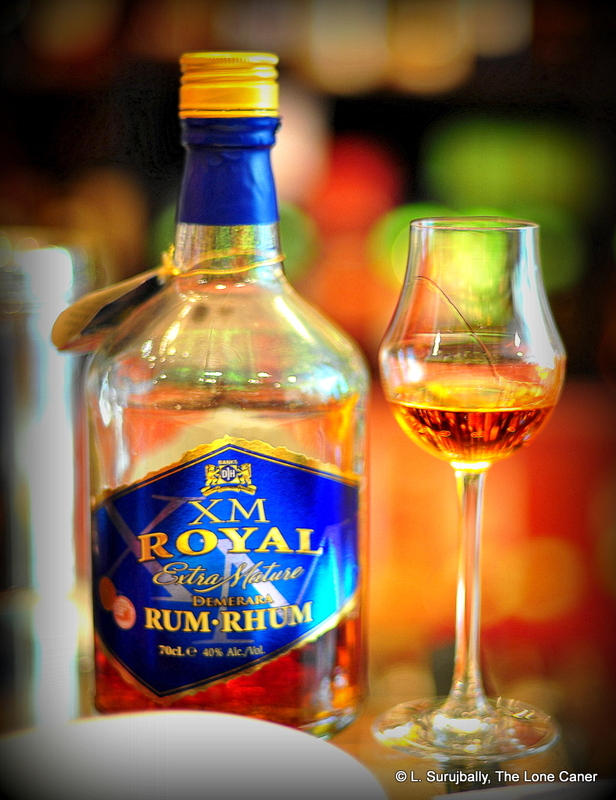 The rum is light golden brown, and has a sharp, pungent nose, and quite frankly, I think the Whiskey Exchange’s review, describing the nose as “Candied orange peel, brown sugar, buttery oak. Crystallised ginger, creamy, toasty vanilla and sugared almonds. 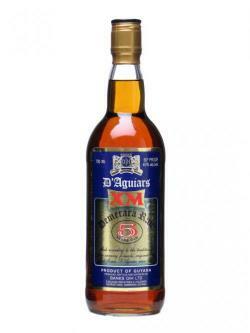 Quite fruity, with baked banana, raisins and hints of blackcurrant jelly developing,” may be just a bit much. The alcohol fumes overpower everything too fast. It’s definitely a mixer rum for this puppy. And a bunch of expats I drank with regularly had exactly the same opinion. The body is light — thin and sharp — and lacks real character, though one can detect vanilla, caramel, burnt sugar and some light hints of fruit, perhaps citrus; but the rum is not particularly smooth, and it jars going down (lest any think I’m assassinating a former favourite in a bid to disown my past, trust me when I say the 10-year is far better, and though I’ve heard of a mythical 50-year old which is reputedly is in a class of its own, I’ve never seen or tasted it; and the comparative King of Diamonds 5-year is paint remover in comparison – in those days, anyway). Some years later after I had been on a Bacardi kick for a bit, I received a gift of this bottle from John, and I was surprised how thin it seemed, mixed or straight. To me, this is the first baseline rum I ever had in my life…like a loved one, I played with others but always returned to her. It will always be on my personal pantheon of favourites, not because it’s a stellar example of the craft (it’s competent work and a decent drink, but a star it is not), but because of the memories it brings up of a time in my life that was unique. I know without thinking that when next I taste this rum, I’ll be transported back to the tropics, under warm starlit skies, the breeze will be blowing though Palm Court (where some hopeful young bint with a terribly nasal voice will be wailing to the accompaniment of a karaoke machine), I’ll be young again, and John and I will be hailing Prince, calling for a double-five and B&H, and talking for the next five hours about how we would fix the world, and how Batman could absolutely kick the s**t out of Spiderman, and why there had to be a third Terminator movie. I’m almost certain there isn’t a man reading this review who doesn’t have at least one drink like that. For background on the maker, Banks DIH, see the company biography.